your best choice when considering a long arm quilter. With all of our included features and the highest quality on the market, no other company can match our machine at such an affordable price. 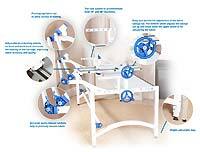 mounts easily on the carriage deck of either the Phoenix or the Falcon frame, and glides smoothly for easy quilting. The Falcon frame is designed with home quilters in mind. A wood frame made of the highest quality and strength, its easy to assemble and expands up to 10 feet (120"). Phoenix is the frame specially designed for TinLizzie18 ESP . The all steel frame is adjustable in height and stretches from six feet (72") to king-size (144"). has also been added to our line of quilting products as the frame specially designed for Ansley26 DLS or TinLizzie18 DLS. , size limitations are no longer an issue! This professional quality metal frame can be paired with either the Ansley26 DLS or the TinLizzie18 DLS.